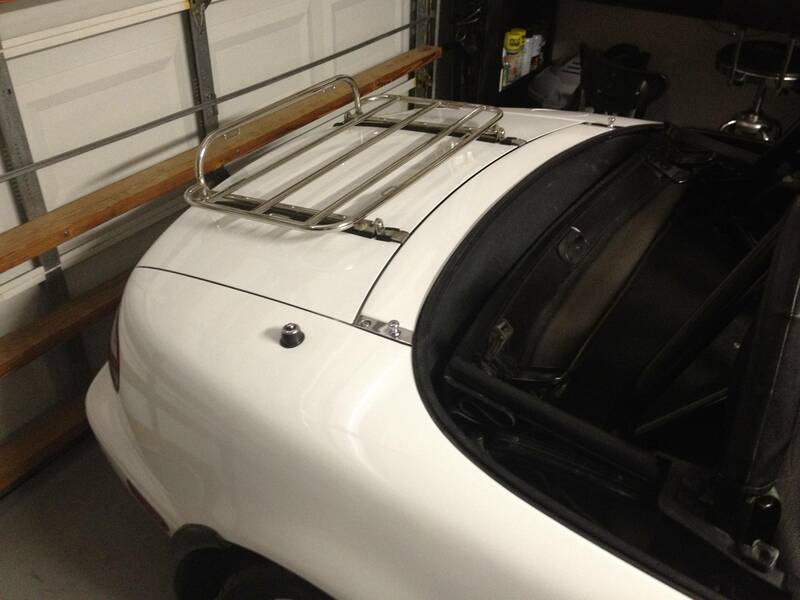 I bought a raceland luggage rack second hand at the all florida miata meet some months ago. The luggage rack is stainless steel and it attaches at the back and front of the trunk. It has a lip that goes over the front and back edge and then a hex bolt is used to tighten it on there so it will not fall off. Overall construction wise it is pretty nice. I have had 0 problems. I did have a missing piece problem so I contacted race land and they had phantastic customer support and they shipped me my part in a very timely manner. I would definitely do business with them again (only for a luggage rack). I have taken the luggage rack to miatas at the gap with luggage attached to it and it held up nicely. I would rate the rack a 10 out of 10 simply because it is made out of stainless steel so rust is not an issue and it really is a install it and forget about it item. It also makes the car look cool. Here is a picture of the item installed. Hmm, I'm not too fond of the design. I have a KG Works spoiler so this rack and my spoiler would interfere with each other. Which rack is the one that mounts to the sides of the trunk? Just because it won't work with your spoiler doesn't mean it is a bad design. I am not certain this will even help you, and personally I think having both looks too busy. I'm not saying its a bad design. I'm just saying that I don't really like it because it doesn't work for me. I'm thinking about whether or not I should buy the one you posted. I'm not sure if it will flow with a vintage roadster theme because of the spoiler.